Dr David Farell, principal of the the Caribbean Institute for Meteorology and Hydrology, looks on while outgoing Caribbean Water and Waste Water Association President Jason Johnson signs the climate change agreement. 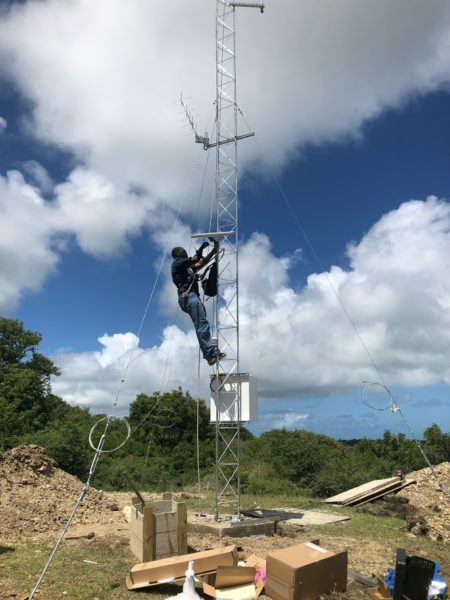 The Caribbean Water and Waste Water Association (CWWA) has signed an agreement with the Caribbean Institute for Meteorology and Hydrology (CIMH) to establish a multi-sector partnership for climate services in the Caribbean. The agreement was signed at the CWWA’s Annual General Meeting (AGM) on Wednesday. The AGM formed part of the five-day conference that ended yesterday. The agreement makes the Caribbean the first region globally to officially create and implement a joint commitment between climate sensitive sectors and a climate services provider to build climate resilience. The CWWA is now the third of seven regional organisations to sign on to the agreement with the CIMH. The partnership is supported by the Building Regional Climate Capacity in the Caribbean Programme – a three-year project made possible through the support of the United States Agency for International Development. The programme is being implemented by the CIMH. Dr David Farrell, principal of the CIMH, welcomed the CWWA’s endorsement of the programme, saying it is an important step towards the building of climate resilience in the region. Outgoing CWWA President Jason Johnson expressed the hope that this signals the start of a long period of collaboration between the two institutions.